RETROSPECTIVE is a review of the latest news and happenings related to art by and about people of African descent. This week, highlights include a couple of major appointments: curator Jamillah James is joining the Institute of Contemporary Art, Los Angeles, and poet Kevin Young is taking the helm of the Schomburg Center for Research in Black Culture. Plus, critics responded positively to the Alma Thomas exhibition at the Studio Museum in Harlem, Carrie Mae Weems offered words of wisdom when she accepted the National Artist Award at Anderson Ranch Arts Center, and 77-year old artist Arvie Smith had a frank conversation about encountering the police while black. Stella Jones Gallery in New Orleans is celebrating its 20-year anniversary with a special exhibition, “INspired: 20 Years of African American Art,” pairing “legacy” artists such as Jacob Lawrence, Elizabeth Catlett, Barbara Chase Riboud, Lois Mailou Jones, Richard Mayhew, and Hughie Lee-Smith, with contemporary artists including Georgette Baker, Najee Dorsey, Leonard Maiden, Charly Palmer, Steve Prince, and Lorna Williams. The black-owned gallery was established in 1996 by Stella Jones, MD, a former OB/GYN, and her late husband Harry Jones. No Commission NY: Art Performs, the art fair Swizz Beatz debuted at Art Basel Miami in December, will be presented in The Bronx, his hometown borough (Aug. 11-14). The event provides free exhibition space to artists and 100 percent of the proceeds from art sales. Festival Albertine, the French-American literary festival in New York (Nov. 2-6), announced its participants will include Thelma Golden, chief curator and director of the Studio Museum in Harlem, poet and author Claudia Rankine, and artist Kehinde Wiley, among others. Award-winning writer and journalist Ta-Nehisi Coates, author of “Between the World and Me,” is organizing this year’s gathering. First Lady Michelle Obama visited the Museum of Contemporary Art, Chicago, and toured Kerry James Marshall‘s “Mastry” exhibition with the artist, his wife and the museum’s director. Seattle-based conceptual artist Natasha Marin launched a reparations website as a ‘social experiment’ designed to explore white privilege. Jamillah James (above) was named curator of the Institute of Contemporary Art, Los Angeles, a new forthcoming museum. Formerly the Santa Monica Museum of Art, ICA LA is expected to open in spring 2017. James previously served as assistant curator at the Hammer Museum in Los Angeles, where she organized collaborative exhibitions and programs for Art+Practice, the nonprofit co-founded by artist Mark Bradford. Kevin Young (at left), a poet and professor of English and creative writing and a curator of rare books and archives at Emory University, was named director of Schomburg Center for Research in Black Culture. The Harlem institution is a division of the New York Public Library. The University of Southern California is attempting to revive its troubled MFA program. The USC Roski School of Art and Design announced five new professors, including artists Kori Newkirk and Edgar Arceneaux, will join the faculty beginning the 2016-17 academic year. ArtTable, the national organization that promotes professional women in the visual arts, has appointed six new board members. New additions include Jennifer Francis, executive director of marketing and communications at the Philadelphia Museum of Art; Juanita Hardy, senior visiting fellow for creative placemaking at the Urban Land Institute; and Sheila McDaniel, deputy director of finance and administration at The Studio Museum in Harlem. [VIDEO] Carrie Mae Weems accepted the 2016 National Artist Award at Anderson Ranch Arts Center in Snowmass Village, Colo., and gave a talk about her work and inspirations. 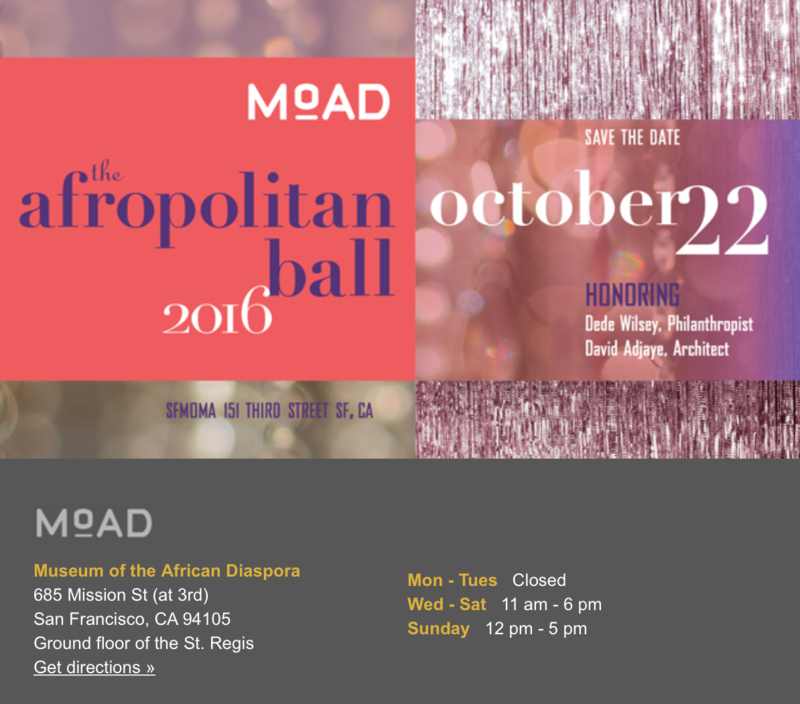 The Museum of the African Diaspora (MoAD) in San Francisco announced architect David Adjaye will be honored at its Afropolitan Ball on Oct. 22. The Getty Foundation’s 2016 Modern Architecture Preservation Grants included for the first time an award for a project in Africa — the Children’s Library in Accra, Ghana, designed in 1966 by the firm Nickson and Borys. Alma Thomas exhibition at the Studio Museum in Harlem has received rave reviews from the New York Times, The New Yorker, and Artforum. New Orleans is hosting the Architecture & Design Film Festival (Aug. 11-13) and the programming includes a screening of “David Adjaye – Collaborations” (Aug. 13), a portrait of the architect David Adjaye through the eyes of his peers and clients. Artist Arvie Smith, whose exhibition “APEX: Arvie Smith” is currently on view at the Portland Art Museum (July 30-Nov. 13), discussed his work, race, and police. Arvie Smith, a 77-year old artist based in Portland, Ore., talked about his work, recent police shootings of black men, and his own experiences with law enforcement. The New York Times published, “Colored Conventions, a Rallying Point for Black Americans Before the Civil War,” a report about early gatherings of black political activists. I think this is great. Feeling more in the loop as a 2nd career artist. On my travel list is a trip to the Schomburg Center in Harlem in 2017. Thanks for sharing news and insights.